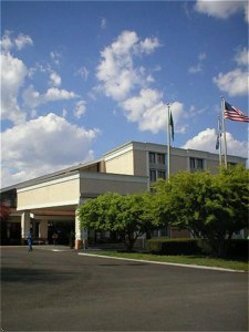 The Holiday Inn Hotel Roanoke is nestled in the Blue Ridge Mountains and is centrally located to downtown Roanoke,2 miles off I-81 and 1 mile from the Roanoke Regional Airport with complimentary airport shuttle. The Hotel has 153 newly renovated oversized guest rooms. All rooms have complimentary wireless and hardwired internet access. All public areas offer complimentary wireless internet access. Our event space and outstanding service makes Holiday Inn Roanoke the optimal meeting place in Roanoke. Our Catering Director coordinates every detail of your event, making us the favorite for weddings, conferences, banquets, military and family reunions and corporate meetings. Maintain your exercise regimen in our fitness center, swim year round in our indoor heated pool or relax in our hot tub. Catch up on work in our complimentary business center at this Roanoke Hotel. We are the only hotel in Roanoke that offers a private outdoor recreational area featuring two volleyball courts, outdoor heated pool, horseshoe pit and picnic area. Unwind in our full service restaurant Passports, for a sumptuous Dinner, cocktail or start your day with a hearty breakfast. Relax, it's Holiday Inn Area attractions nearby: Blue Ridge Parkway, Virginia Tech, Valley View and Tanglewood Malls, Martinsville Speedway, Roanoke and Salem Civic Centers. This hotel is committed to providing accessible facilities under the American Disabilities Act. If your accessibility needs are not met, please contact the Hotel Manager on Duty. Should you require additional information regarding accessible facilities for guests with disabilities, please call 1-800-Holiday (U.S. and Canada) or contact the hotel directly. For the hearing impaired, TDD service is available at 1-800-238-5544 within the U.S. and Canada.